Jenny brings extensive experience and expert bilingual writing and editing skills to her role as Communications Specialist. Before joining the Strauss team, Jenny worked for non-profits for over a decade. She has held roles in communications, event management, administration and human resource management over the years. Jenny uses her creativity and meticulous attention to detail to write, proofread and edit communications in both English and French for Strauss and its clients. She is also responsible for updating social media platforms and website content. 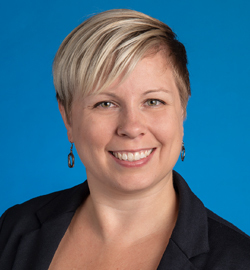 Jenny has earned two university degrees: a bachelor’s degree in English and French language linguistics from the University of Winnipeg, and a Master of Arts in French from Simon Fraser University. One of the most exciting tasks for me is seeing through a project from start to completion, whether that is writing a blog, updating a website or coordinating the work of a publication. I enjoy the thrill of the challenge while also knowing that I am supporting the important work of our clients to achieve their goals.